Written and directed by Lisa D'Amour, Nita & Zita features Katie Pearl as Zita and Kathy Randels as Nita. New Orleans jazz pianist Tom McDermott provides a live score of original songs. Nita & Zita premiered at the State Palace Theater in New Orleans in June, 2002 after a two year process of research and development. 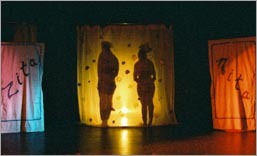 The project began with research in New Orleans in 2000 and a work-in-progress showing at Zeitgeist Theater Experiments. Performer Anne-Liese Juge-Fox originated the role of Zita and was an essential part of the development process. After the birth of Anne-Leise's gorgeous son Hal, she turned the role over to Lisa's long time collaborator Katie Pearl. Katie, Kathy and Lisa worked over the course of 2001 to recreate and remount the performance at The Core, a cabaret space housed within the State-Palace Theatre. The show ran for 3 weeks to packed houses. David Cuthbert of the Times Picayune called the show "a fascinating cabaret turn…Randels and Pearl play with the easy, irascible give and take of two people joined at the hip for too long…." We revived the show at Southern Repertory Theatre in New Orleans as the second leg of our 2003 tour. Nita & Zita tells the real life story of two sisters - dancers, seamstresses, painters - and the mystique that still resonates long after their death. In 1922, the sisters from the Jewish town of Baia Maire, Romania, stepped off a ship called "The Reliance" onto Ellis Island. For Flora and Piroska Gellert, this was the beginning of a long life of travel, performance and fierce personal style. Traveling through this country and beyond as "Nita and Zita, International Dancers," Flora and Piroska dazzled audiences with their handmade costumes and exotic routines featuring petite Piroska, a contortionist. In the early 1940's, they settled into a Creole cottage in New Orleans, performing in the French Quarter and in a nearby bar until their retirement in the 1950's. Quickly, their home became the sisters' refuge, their reclusive habits making them instant neighborhood legends: rumors spread about the "gypsy ladies" who walked to the grocery store wearing formal dresses, and who painted their entire house, inside and out, with wild polka dot patterns. More on the real Nita and Zita . . .